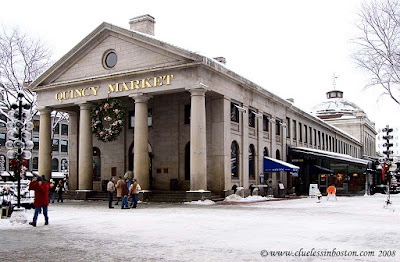 This is a shot of Quincy Market from December '07. Winter, spring, summer, fall - that is a great spot. Not far from there they used to have 2 lobsters for the price of 1. Sure hope they still do as I am starved for lobster also and May should be the season. Isadora: 2 for 1 lobster is great. I'll have to try to find it and let you know if it is still there. May you say? That is too elegant for a market...it could pass for a government establishment. Good day!